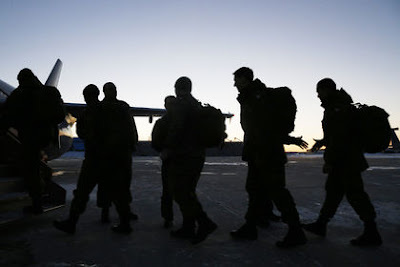 TORONTO, Ontario -- Less than a year after Prime Minister Stephen Harper told Russian President Vladimir Putin to “get out of Ukraine,” Canadian soldiers have landed in the troubled country. There are 150 of them to be precise — military personnel with expertise in explosives detonation and other battlefields skills. These troops are there to train and prepare the Ukrainian army for battle. “We have a mandate there until March 2017,” said Maj. Isabel Bresse, adding 90 troops landed this week and 60 the week before. Defence Minister Jason Kenney announced in April that Canadian troops would be dispatched to the global hot spot. He stressed the soldiers would be stationed far from any fighting and be charged with the task of training Ukrainian forces. The soldiers, from 2 Canadian Mechanized Brigade Group (2 CMBG) — based at CFB Petawawa — will be stationed in the months ahead at the Ukrainian Armed Forces International Security and Peacekeeping Centre in Yavoriv, minutes from the border that divides Ukraine and Poland. The military personnel — the most recently arrived group landed Monday — are the first boots on the ground as part of Operation UNIFIER. Their job is to help get the Ukrainian army up to top fighting form while the Eastern European country continues its military and political struggles with Putin’s Russia. More than 6,900 people have died in the fighting. It’s a conflict that has been heating up this week with people, including a police officer, killed in protests outside of Ukraine’s parliament. Harper has talked tough since the Russian invasion and annexation of Crimea and the shooting down last July of a Malaysia Airlines jet over eastern Ukraine which killed 298 innocent people. And now that talk has turned to action. “We’re here to pass on our knowledge to our Ukrainian partners to ensure they have the skills to survive and thrive on the battlefield,” Lt.-Col. Jason Guiney — commander of Canada’s Joint Task Force Ukraine — said in a statement sent to me by the Canadian Armed Forces. It’s a busy time for Canada’s military. This mission comes after 10 years of fierce fighting in Afghanistan and policing missions in the skies over Lithuania. Toronto Sun photographer Ernest Doroszuk and I travelled to both and got a sense of the appreciation and respect regular people on the ground had for Canada’s stand and contribution. This is the second major military operation involving Canadians during the federal election. Canada is also helping to battle ISIS in the skies over Iraq and Syria. It’s mainly ground work in Ukraine. “One of the specialized training activities will consist of an explosive ordinance disposal and an improvised explosive device disposal program at the Ukrainian Ministry of Defence De-mining Centre in Kamyanets-Podilsky. Canadian engineers will be partnering with Ukrainian soldiers to enhance their existing counter improvised explosive device operations,” said a Department of National Defence fact sheet. At a time when a politician comparing unarmed Canadian vets providing security for Harper with Nazis grabbed headlines, it’s a good time to get behind our brave men and women in uniform. In a democracy, the politics of where our troops go and why should always be debated. But once that decision is made, their safety and sacrifice — and our backing of them — never should be.